When an employer must fire an employee for cause, this letter makes the action clear and includes room to describe why the company was forced to take that action. 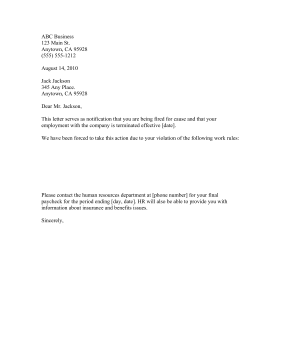 This letter serves as notification that you are being fired for cause and that your employment with the company is terminated effective [date]. Please contact the human resources department at [phone number] for your final paycheck for the period ending [day, date]. HR will also be able to provide you with information about insurance and benefits issues.